Let's say I have secret files which I will encrypt. The resulting container will be shared and might be intercepted. Not good, but that's okay - that's why I encrypted the data in the first place. However, now, I'll encrypt and share the same data again. With the same passphrase. The container will be different (because the key changed) but the data inside it is identical. And the attacker knows this. Does this open the encryption to any vulnerabilities from a cryptographical standpoint? Pardon my lack of technical terms. I guess this would be a ciphertext-only attack? But modified in a way that each plaintext (my data, my files) prior to encryption is the same? ...but the data inside it is identical. And the attacker knows this. Does this open the encryption to any vulnerabilities from a cryptographical standpoint? No. If it did, then encryption would not be very useful. Even in all of these scenarios, a modern cipher will remain secure. Not only will it protect the plaintext from discovery, no adversary will even be able to distinguish a ciphertext from a random stream of bits with a non-negligible probability. then the messages will remain as secure as the passphrase that protects them. How secure the passphrase is will depend on how long/complex it is, combined with how the key is derived from it. Not the answer you're looking for? Browse other questions tagged encryption aes cryptanalysis ciphertext-only-attack or ask your own question. GPG and PAR2 error correction data from the plain archive, will it compromise security? 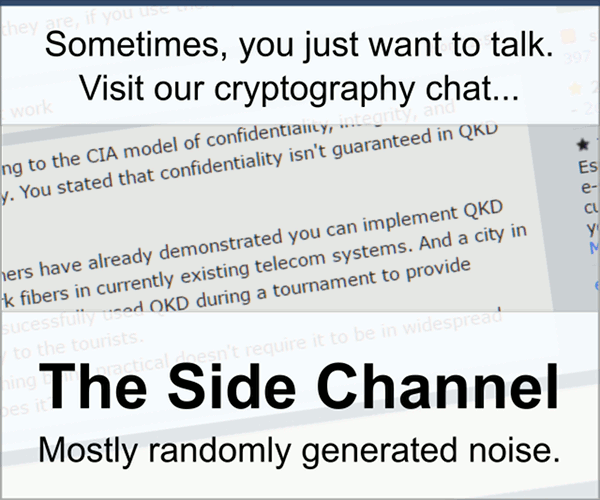 Do ciphertexts leak information about their algorithmic creators? How is LUKS dm-crypt secure if the key is stored with the encrypted data? How secure is using a pad (using xor) on a encrypted data, for the purpose of obfuscating/hiding the underlying encryption? Are all encryption tools made equal? Is there a downside to encrypting too much data with the same key? Can I use different initialization vectors (IV) for the same data in AES-CBC?